In the spirit of trying to keep cool in the evenings around the farm we are now turning to chilled soups! I’m a huge fan of gazpacho but our tomatoes are just now coming on so I’m going to hold off for a week or two before whipping up a batch. So in the meantime, I’ll happily be dishing up this simple soup for me and Taylor as we battle this seemingly never ending heatwave. This soup is light, flavorful and so damn refreshing! I love how the sweet and earthy beets pair with the tangy yogurt and lemon. The addition of fresh dill takes this over the top. 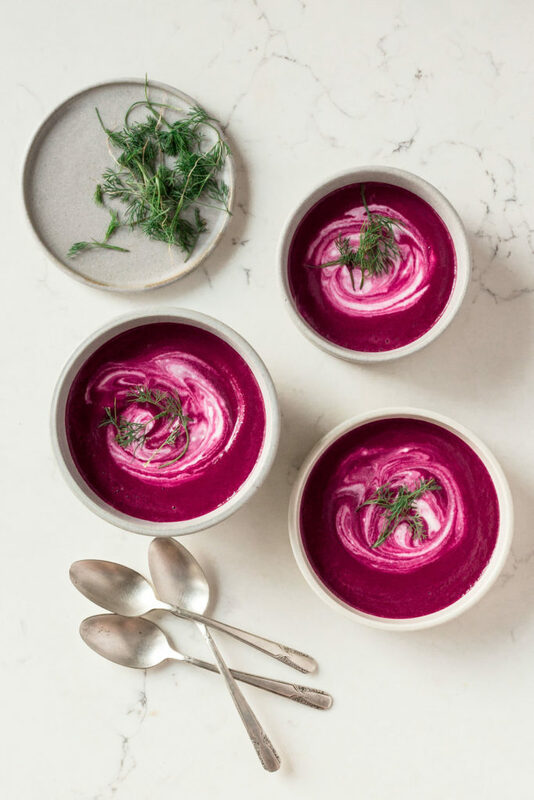 This is a simple meal to prepare and as long as you cook your beets and onion in advance this can be on the table in minutes. And while this soup is intended to eat chilled, it can be served at room temperature or even slightly warm. We just bought a whole bunch of beets from the market, so this is perfect! Especially since Hong Kong technically doesn’t really become winter until like, January – and even then it’s not cold! Do you need to peel the beets first for this recipe? We receive a monster 2 pound beet in our CSA this week and I’ve been looking for something to do with it that doesn’t involve roasting it whole for 4+ hours. Am curious if you peeled or used it as is for this recipe. nope! it’s not necessary to peel the beets. I hope you enjoy the soup! I’m so glad you love it!! I like your variations too! I just tasted it and I think it’s going to be good. (Waiting for it to chill now). I just chopped up the stems and greens and cooked them too because I have a little green vegetable shunner. After blending, they are invisible. I use the stems too, so nothing goes to waste. Love this recipe, have made numerous times!